I had my whole schedule planned today—a list of tasks and plenty of time to complete them all. Guess how many I finished? It wasn't because I didn’t do anything. It was because my phone started ringing. Maintenance managers know what I’m talking about. Stuff happens. Emergencies come up. And we’ve all re-prioritized tasks based on who’s yelling the loudest. But as more maintenance departments move from a reactive to a proactive maintenance strategy (thanks to CMMS software), there’s less yelling because preventive maintenance means fewer emergencies and breakdowns. It also means prioritizing your maintenance tasks becomes even more important. You want to get the important stuff done first, of course. But you don’t want other things to slip through the cracks. So how do you prioritize your maintenance tasks? Emergency tasks are urgent health/safety problems or operational disruptions. Some examples include loss of power or water supplies, HVAC failure, natural disasters, fire, key asset breakdowns, and major security problems. Obviously, those immediately go to the top of the list, no matter how long that list is. Next you have high priority tasks that will directly affect operations in the near future. These might include leaking roofs, high-use equipment that is not performing well, repairs to key assets, and safety inspections. Then there's medium priority tasks, which typically include preventive maintenance schedules. These tasks will affect operations eventually, and need to be performed to maintain optimum production. Examples include replacing filters, changing oil, checking belts, scheduling vendor services, etc. Last, but not least, maintenance teams always have low priority requests or tasks that need to be done as fill in work, but are not vital to day-to-day operations. These tasks might include non-critical repairs, furniture installation or replacement, cosmetic painting, etc. 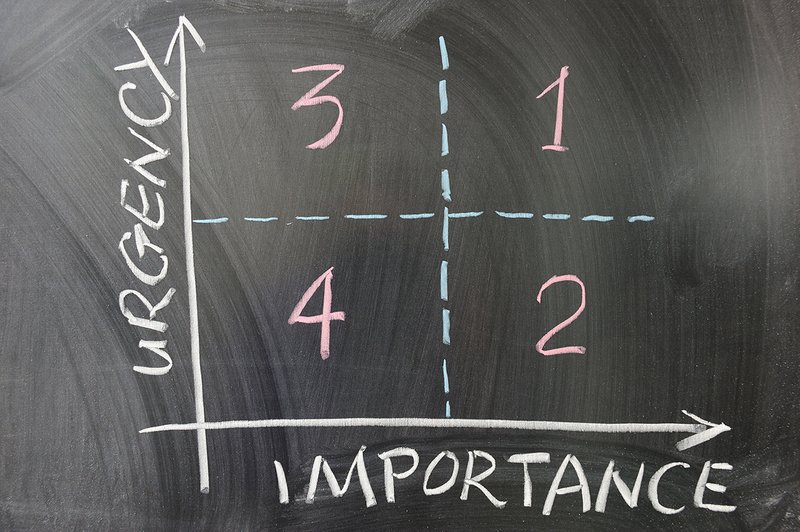 The trick is to keep those lower priority tasks from becoming high priority or emergency situations. So how do you decide what to tackle first? I’ll share my method in my next post. In the meantime, how do you prioritize your maintenance tasks? Leave a comment or contact me.